Waiting in the ubiquitous checkout line, I spied a National Geographic special publication, “50 of the World’s last great places – Destinations of a Lifetime.” Thumbing through, right between Bialowieza (remnants of ancient European forests on the border of Poland and Belarus) and Canada’s oldest national park, Banff, was our own Jocassee Gorges. The fecund Gorges bathed in nearly 100 inches of rainfall annually extend from Lake Jocassee near where North Carolina, South Carolina and Georgia meet, northward and eastward to Caesar’s head State Park in South Carolina. The Whitewater, Horsepasture and Estatoe rivers plus countless streams, springs and seeps combine to create a magical land of waterfalls, spray communities and nonpareil flora and fauna diversity. There are more than 60 species of rare and/or threatened plant species, some of which are endemic to the Gorges. It is home to black bear, bobcat, whitetail deer, turkey, ruffed grouse, myriad Neotropical migrants and perhaps the greatest salamander diversity in the world. The name Jocassee is from the Cherokee and supposedly means “Place of the Lost One.” Cherokee lore has it that rival tribes – the “Brown Vipers” and the “Green Birds” inhabited the Gorges and as legends go a young warrior of the Brown Vipers broke his leg while hunting in the domain of the Green Birds. Jocassee, a Green Bird maiden came to the warrior’s (Nagoochee) rescue and nursed him back to health. The two subsequently fell in love but during a battle between the two tribes Nagoochee was killed. Heartbroken, Jocassee entered the water, but rather than sinking, walked across the surface to be embraced by and disappear with Nagoochee’s ghost. Almost as diverse as the geology, topography, flora and fauna of Jocassee Gorges are the partnerships and cooperation that went into preserving this incredible wilderness. “The” Gorges themselves comprise about 43,000 acres and were preserved through a partnership with the South Carolina Department of Natural Resources, Duke Energy, the Conservation Fund, the U.S. forest Service, National Wild Turkey Federation, The Nature Conservancy, the Richard King Mellon Foundation, and dozens of other groups, organizations and individuals. But these 43,000 acres help connect the Mountain Bridge Wilderness to the east and National forest lands to the west creating close to 200,000 acres of contiguous wilderness. 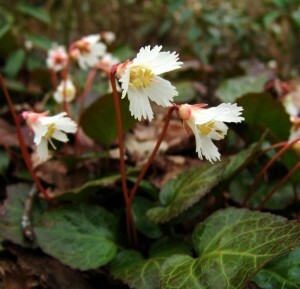 Oconee bells, Shortia galacifolia, a graceful beautiful spring ephemeral has become the floral poster-child of the Gorges. This gorgeous breath of white that graces the “blue wall” of the Blue Ridge Escarpment was lost in Paris for the better part of a century. French botanist Andre Michaux had collected a specimen back in 1788 and placed it in his herbarium in Paris where it went unnoticed for 50 years or so until American botanist Asa Gray, nosing through the herbarium discovered the specimen. Botanists searched to no avail but in 1877 a teenager named George Hyams walked upon a colony of Oconee bells along the Catawba River in North Carolina. Oconee bells were almost lost again when this rediscovery site was flooded by Duke Energy as they damned the river for electricity production and created Lake Jocassee. Oconee bells is a biogeographic relic meaning it is part of a once widespread taxa that is now restricted to a small geographic area. The closest relative to Oconee bells is found in China and Japan. Another rare, disjunct species known from Jocassee gorges is Turnbridge film-fern. This fern’s closest relatives are found in the West Indies. But don’t worry. If you travel to the Gorges and fail to discover either of these rare plants, just sit down at the base of one of the many waterfalls, gaze into the mist and you will realize you are, indeed, in one of the last great places on the planet.